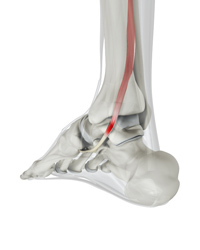 The Achilles tendon is one of the longer tendons in your body which stretches from the heel bone to your calf muscles.  It appears as a band of tissue at the back of your ankle and above your heel. 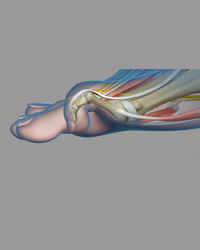 The Achilles tendon attaches to the heel bone over a broad area. The exertion of force or repeated stress on the tendon, where it attaches (inserts) to the heel bone can cause tearing, swelling and pain. This eventually leads to wearing and tearing of the tendon. Flatfoot, also known as “fallen arches” or Pes planus, is a deformity in children’s feet in which the arch that runs lengthwise along the sole of the foot has collapsed to the ground or not formed at all. Flatfoot is normal in the first few years of life as the arch of the foot usually develops between the age of 3 and 5 years. 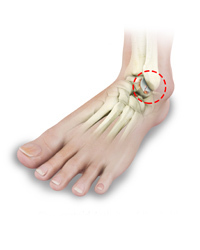 Flatfoot can be rigid or flexible. 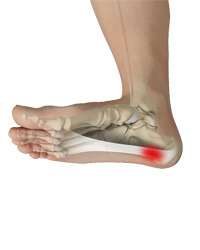 Flexible flatfoot usually resolves without any treatment needed unless pain is involved. 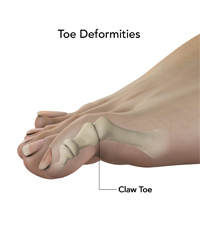 This is a deformity of the lesser toes (2nd, 3rd or 4th) of the foot. The toe is bent at the middle joint. 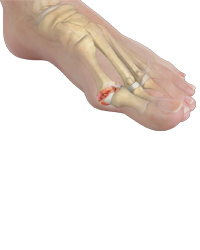 It can result in pain on top of the toe knuckle (proximal interphalangeal joint) and also the tip of the toe. It can be the cause of corns. 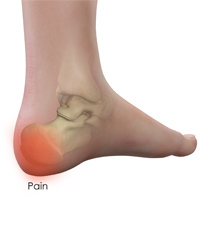 One of the most common causes of heel pain is a problem called "plantar fasciitis". 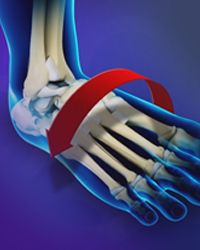 Plantar fasciitis is the term doctors use when a part of the foot called the plantar fascia gets irritated or inflamed. 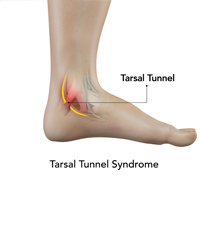 The plantar fascia is a tough band of tissue that connects the heel bone to the toes. 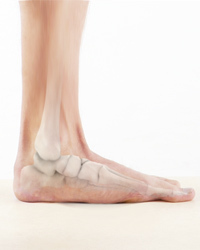 This is a degenerative condition affecting the big toe (hallux) metatarsophalangeal (MTP) joint at the base of the toe. It results in pain and restriction of movement (rigidus). The changes in the joint are essentially those of osteoarthritis, with loss of cartilage, formation of osteophytes at the joint margin (spurs) and changes in the bone (hardening or sclerosis).